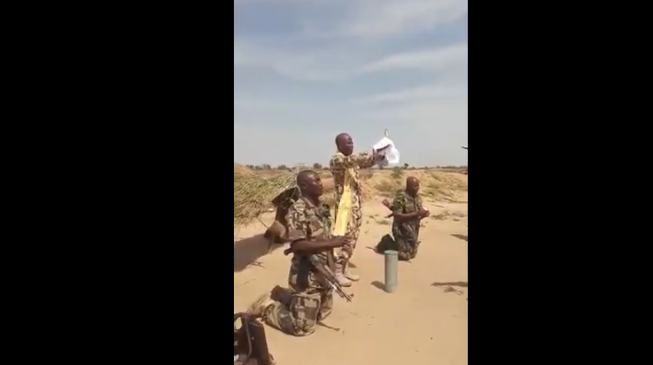 In the video, the soldiers, who clutched their riffles, sang emotionally: “My song everyday, father draw me nearer, draw me nearer, nearer to thee,” they sang a popular Christian song in unison. Numbering about 15, the soldiers sang repeatedly as they performed what could be likened to Eucharistic celebration, a Christian rite that is considered a sacrament in Orthodox churches. One of them who acted as a Catholic priest raised up what looked like the communion. The soldiers obviously forget their worries that moment. The location of the troops is unknown and so also is the time when the video was recorded.